Shechen Gyaltsab Gyurme Pema Namgyal (Tib. ཞེ་ཆེན་རྒྱལ་ཚབ་འགྱུར་མེད་པདྨ་རྣམ་རྒྱལ་, Wyl. zhe chen rgyal tshab 'gyur med padma rnam rgyal) (1871-1926) — the fourth Shechen Gyaltsab, he was the root teacher of Dilgo Khyentse Rinpoche and one of the main teachers of Jamyang Khyentse Chökyi Lodrö. 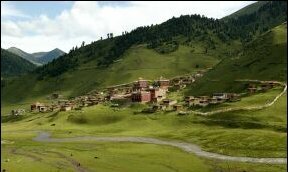 The supreme master Shechen Gyaltsab Gyurme Pema Namgyal was born in a place called Dzokyi Tsolung, which belongs to the regions of Lhatok and Derge, in the Iron Sheep year of the fifteenth calendrical cycle (1871). His father, Sherab, belonged to the Adro clan and his mother, Namkha Drolma, was the daughter of a family of Drongpa officials. He was recognized by Jamyang Khyentse Wangpo as the reincarnation of Orgyen Rangjung Dorje, given the name Gyurme Pema Tenzin Khedrup Gyatsö’i De, and ceremoniously installed on a great Dharma throne as the fourth Gyaltsab, or ‘regent,’ of Shechen Tennyi Dargye Ling monastery. From his own uncle, Pema Wangchen—or Kyi Yang as he was widely known—he learned how to read and received teachings on the common sciences, including The Mirror of Poetics, the three systems of Sanskrit grammar (known as Kalapa, Chandrapa and Sarasvata), The Treasure Mine of Composition, the major texts of the ‘white’ and ‘black’ astrological traditions and so on. He received the vows of a novice monk from Dzogchen Khenpo Pema Damchö Özer and was given the name Pema Namgyal. He went on to receive full ordination from Gemang Khenpo Yönten Gyatso, and maintained the outer pratimoksha discipline without the slightest transgression in terms of what should be adopted or abandoned. He studied the discipline of the bodhisattva vows with masters such as the great Khenpo Karma Tashi Özer, the fifth Rabjam Rinpoche and so on, and followed all the points of the inner training of the bodhisattvas concerning what to do and what not to do, so that his mind became completely filled with bodhichitta, and he sought only to benefit others. 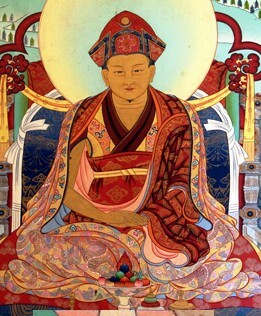 From Jamgön Khyentse Wangpo, he received empowerments and instructions on the practices of the Nyingma kama and terma, such as Kagyé, Lama Gongdü and Vajrakilaya. He also studied many traditions of the Sarma schools of secret mantra, including Jé Tsongkhapa’s Great Exposition of the Stages of the Path (Lamrim Chenmo) and Karmapa Rangjung Dorje’s Pointing Out the Dharmakaya. He received the ripening empowerments, liberating instructions and supporting transmissions for the Treasury of Precious Termas (Rinchen Terdzö) from Jamgön Kongtrul Lodrö Thayé and the Tenth Surmang Trungpa Rinpoche, Karma Chökyi Nyinché. The sublime Kongtrul Rinpoche also bestowed on him an explanatory reading transmission for all three volumes of his Treasury of Knowledge (Sheja Dzö), from the opening verses of homage through to the colophon at the end. Kongtrul Rinpoche placed the texts on his head and granted him formal permission to transmit these teachings in future. He also received the Treasury of Kagyü Mantras (Kagyü Ngak Dzö) and the Collection of Nyingma Tantras (Nyingma Gyübum). He received the Treasury of Precious Instructions (Damngak Dzö) and the Treasury of Extensive Teachings (Gyachen Kayi Dzö) in their entirety, together with the empowerments, reading transmissions and instructions, from the great Khenpo Karma Tashi Özer. From Jamgön Mipham Rinpoche, he received the Great Secret Commentary on the practice of Yangdak, the cycle of Jampal Dzogpachenpo, An Explanation of the Kagyé, Entrance to the Way of Knowledge (Khenjuk) and he was able to clarify the difficult points in the major texts of sutra and mantra. He also received clarifications on his own practice. In addition, he relied on such great masters as the fifth Shechen Rabjam, Khenpo Kunpal, Kathok Situ, Palpung Gyatrul Kunzang Tenpé Nyima, Dzogchen Khenpo Pema Vajra and Patrul Jikmé Chökyi Wangpo as his teachers. His studies were vast and included a great number of commentaries and collected writings of the great masters of the past. Most notably, he received the reading transmission of the precious Translated Words of the Buddha (Kangyur) on two occasions, from Barchung Choktrul Thubten Gelek and from the great Troshul Khenpo Tsultrim Gyatso. For more than twenty years, he focused his practice on the key points of the generation and completion phases, with the result that his qualities of experience and realization reached the very highest level. He gained all the advanced realizations of the paths and bhumis, and through taking to heart the essential points of the practice of Clear Light Dzogpachenpo, he purified the fixations of the conceptual mind. As he gained naturally arising realization, the great treasure of his wisdom mind overflowed. The brilliant light of his enlightened activity in explanation, debate and composition shone in all directions, and many great masters and holders of the teachings became his students, including Dzongsar Khyentse Jamyang Chökyi Lodrö, the sixth Shechen Rabjam Kunzang Tenpé Nyima, Jamyang Loter Wangpo, Dilgo Khyentse Rabsal Dawa, the incarnation of Kongtrul, Palden Chökyi Wangchuk, Pema Drimé Lekpé Lodrö, Dzogchen Lingla Tulku, Khenpo Sochö, Abu Lhagang, Kathok Khenpo Nüden and many others, just like a garland of stars in a constellation. In this way, this great master undertook the three practices of listening, reflecting and meditating for his own benefit, and the three activities of teaching, debating and writing for the benefit of others. Finally, at the age of fifty-five, in the Fire Tiger year of the fifteenth calendrical cycle, on the eighteenth day of the fifth month, he demonstrated merging his wisdom mind into the dharmadhatu, the inseparable union of basic space and wisdom. A commentary on Mipham Rinpoche's The Oral Transmission that Gladdens the Hearts of the Dharma Kings: Prayer for the Spread of the Nyingma Teachings. Annotations to Zurchungpa's Testament. See Dilgo Khyentse Rinpoche, Zurchungpa's Testament: A Commentary On Zurchung Sherab Trakpa's Eighty Chapters Of Personal Advice (Ithaca: Snow Lion Publications, 2007). A Necklace of Jewels. Published in Zurchungpa's Testament: A Commentary On Zurchung Sherab Trakpa's Eighty Chapters Of Personal Advice (Ithaca: Snow Lion Publications, 2007). A commentary on the Tukdrup Barché Künsel: Divine Flower: A Guide to the First Level of Practice of “Accomplishing the Guru’s Mind: Dispeller of All Obstacles” (Wyl. thugs sgrub bar chad kun sel gyi rim pa dang po’i khrid kyi zin bris lha rdzas me tog). Published in English in A Practice of Padmasambhava: Essential Instructions on the Path to Awakening by Shechen Gyaltsap IV and Rinchen Dargye, (Ithaca, Snow Lion Publications, 2011). Nyoshul Khenpo, A Marvelous Garland of Rare Gems: Biographies of Masters of Awareness in the Dzogchen Lineage (Junction City: Padma Publications, 2005), pages 426-428. Shechen Gyaltsap IV and Rinchen Dargye, A Practice of Padmasambhava: Essential Instructions on the Path to Awakening (Ithaca: Snow Lion Publications, 2011). This page was last edited on 9 November 2016, at 16:17.